Following my August 2018 visit to Inuvik and Tuktoyaktuk NT (covered in another post), I flew down to Norman Wells for a two-night stopover on my way back to Yellowknife. That included some roads-related adventures around town on the one full day of my visit. I visited the town largely because it's the administrative center of the territory's Sahtu Region, and its de facto "county seat". That improved on my marginal "spinback" clinch of the region in 2012, when I crossed into NT from the end of pothole-ridden YT 6 (one of the worst highways I've ever traveled, in my former pickup truck). I promptly turned back because the unnumbered road on the NT side, dead-ending 16km later at a wildlife check station, was even worse than YT 6. There are no roads to Norman Wells from anywhere else, except on winter roads a few months of the year. 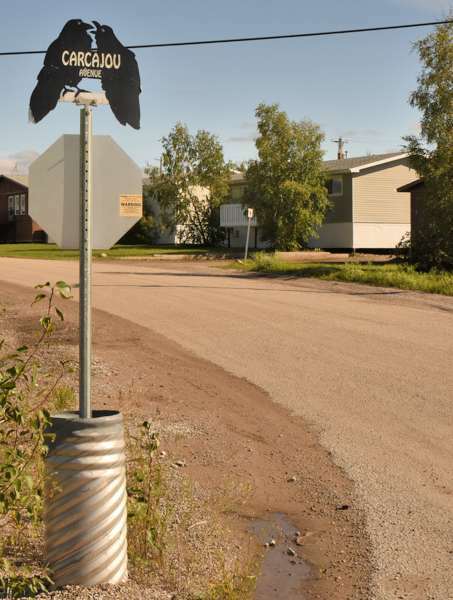 The Sahtu Region has no regional government (some towns in the region, including Norman Wells, have municipal governments), but the region's satellite offices of major territorial government departments are clustered in Norman Wells. Indeed, many of those offices are in a wing of the hotel where I stayed, down the hall from my room. A more road-related point of interest was the Norman Wells Historical Centre a few blocks west of my hotel. 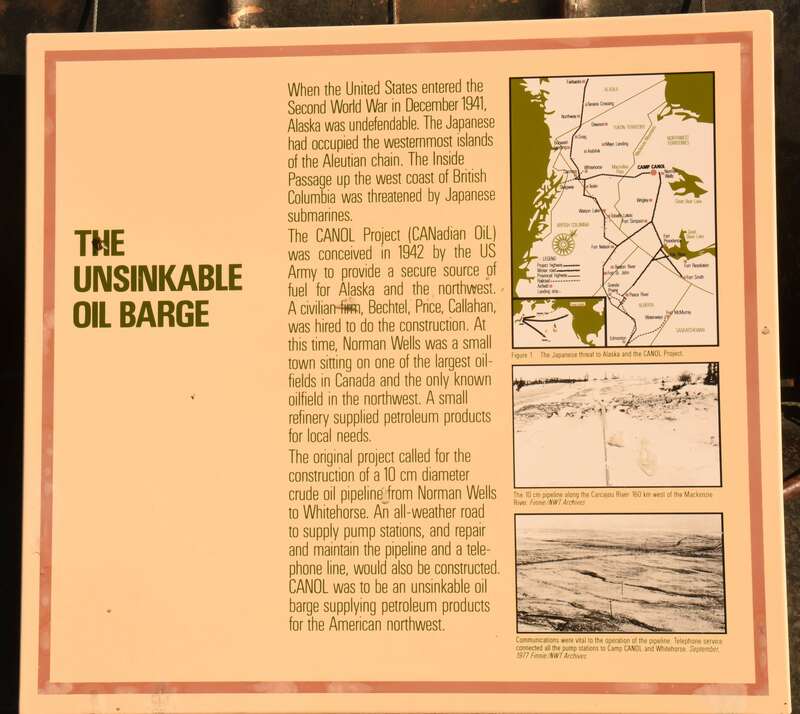 The Centre has many exhibits and books about the historic Canol Road, built for construction of an oil pipeline that briefly pumped crude oil from Norman Wells to Whitehorse YT during World War II. 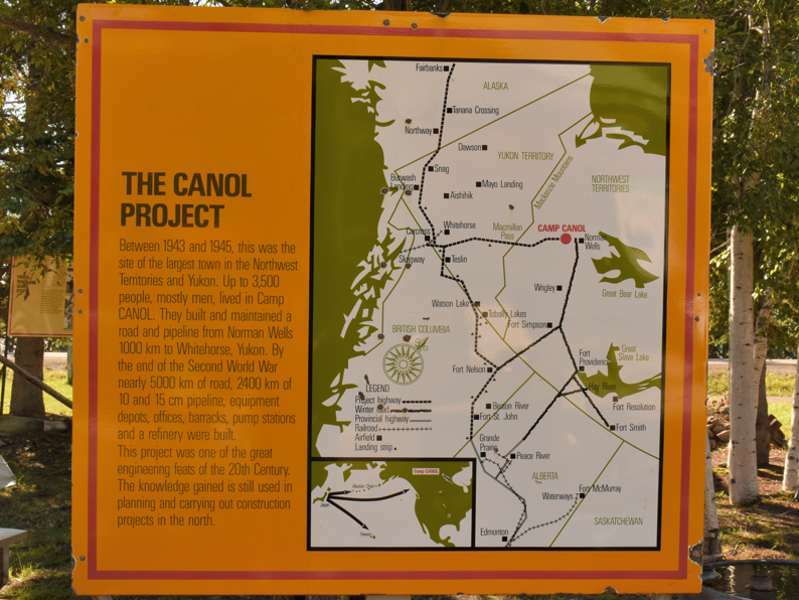 Between Norman Wells and the wildlife check station mentioned above, the abandoned road is impassable by motor vehicles, but a difficult 355km hike is still possible on what is now called the Canol Heritage Trail. 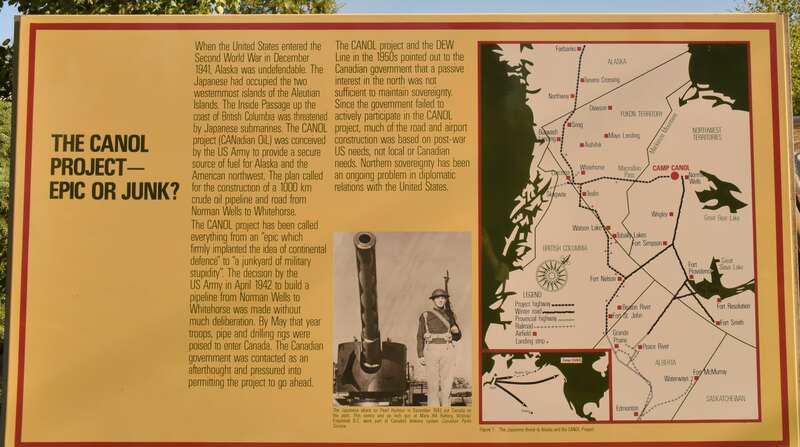 Some maps indicated there was a ferry crossing the Mackenzie River to the Trail, but that turned out to be incorrect. If you want to hike or sight-see the old road, you need to make reservations long in advance with a local outfitter to take you across the river on a small boat. So that dashed my hopes of exploring a little of the old road while I was in Norman Wells. ^ ^ ^ These are some of the interpretative panels outside the Centre, placed among the remnants of some of the construction equipment used to build the Canol Road. 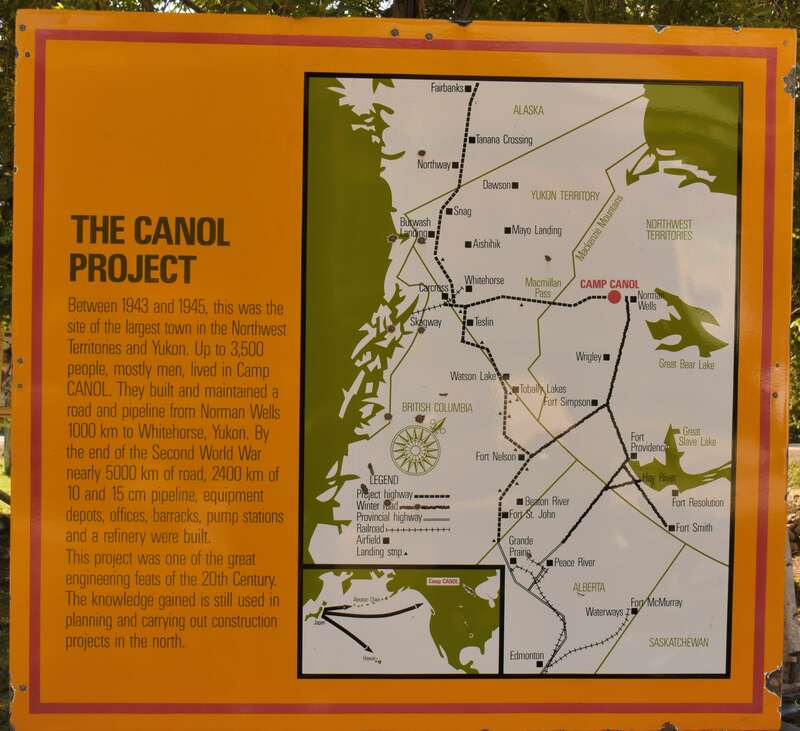 They summarize some of the history of and issues with the short-lived Canol project. Basically, by the time the hastily-planned pipeline was completed, World War II was winding down, and the Japanese submarine fleet was pushed back far away from the Inside Passage of British Columbia and southeast Alaska. 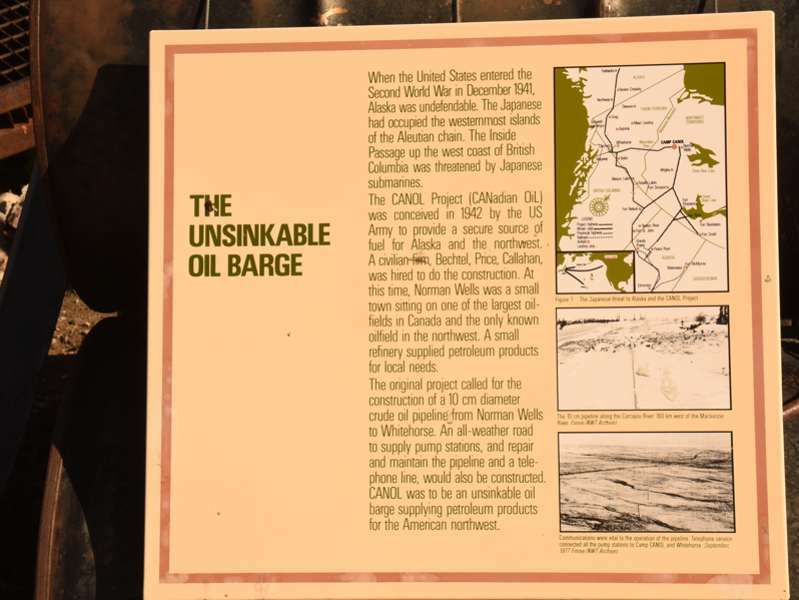 So it was once more safe to transport oil by tanker along the coast, which was more economical than oil from Norman Wells through the pipeline. The pipeline was shut down soon after the oil started flowing. 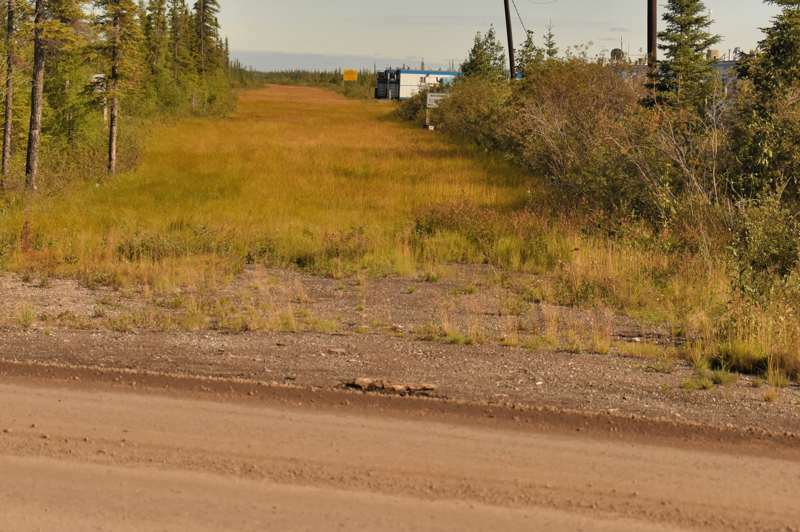 The oil fields of Norman Wells are still active, but its oil is now sent south through a pipeline to northern Alberta. 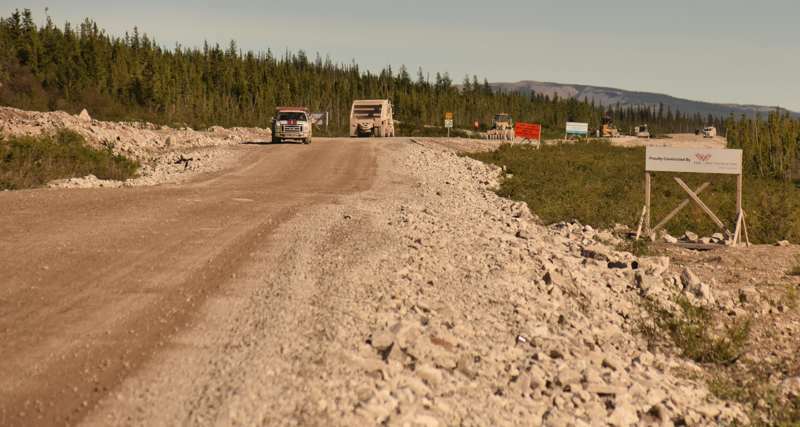 After my visits to the Historical Centre, I went to see winter roads and new road construction from Quarry Road (north-south road east of the Norman Wells airport). The sites were within long walking distance from my hotel, but I was uncomfortable with the risk of bear attack, and rental cars were scarce, so I took a taxi. ^ My first stop was the winter road northwest to Fort Good Hope and Colville Lake, viewed from Quarry Rd. It's closed most of the year, except when the ground is frozen enough to support vehicles, and also has snow cover to give vehicles a suitable driving surface. ^ On southbound Quarry Rd. south of the Fort Good Hope junction, a junction sign directing traffic to the winter road southeast to Tulita, Deline, and Wrigley. It is left to motorists to figure out that you can't get there from here most of the year. ^ The Wrigley winter road, which has since been partially bypassed by the new Canyon Creek access road shown in the next two photos. Aside from the lack of a usable road surface in the summer, in the distance is a sign confirming the winter road was closed. ^ ^ Two photos of the new all-season Canyon Creek Access Road near its start at Quarry Rd., close to (but not at) the intersection with the Fort Good Hope winter road. 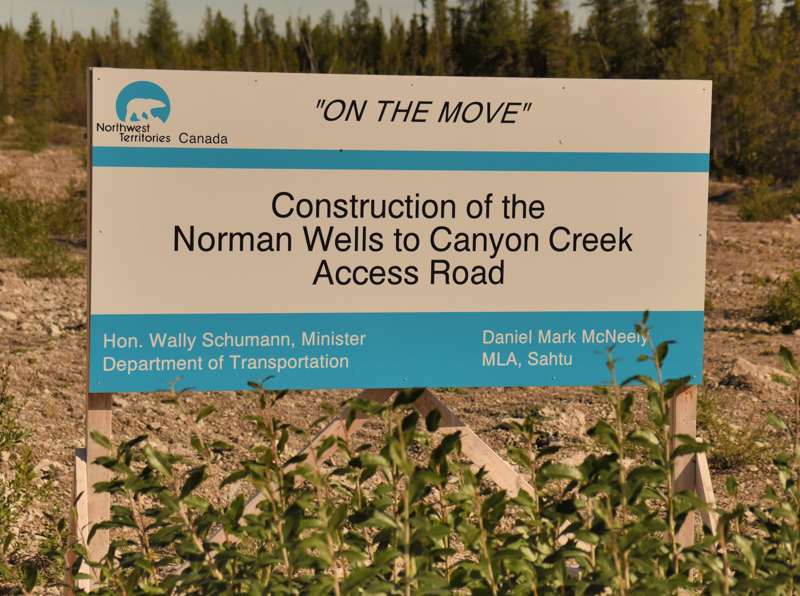 The new road was still under construction while I was in Norman Wells, but opened to traffic three months later. It is about 14 km long on new alignment, and replaces part of the Wrigley winter road. For now, it serves only undeveloped (so far) recreational areas, and winter road travelers. It was planned as a first step to filling the ~330 km all-season road gap between Norman Wells and the current end of NT 1 in Wrigley. It also was a chance to give local workers more experience with road construction, which might help with later phases of all-season road construction. 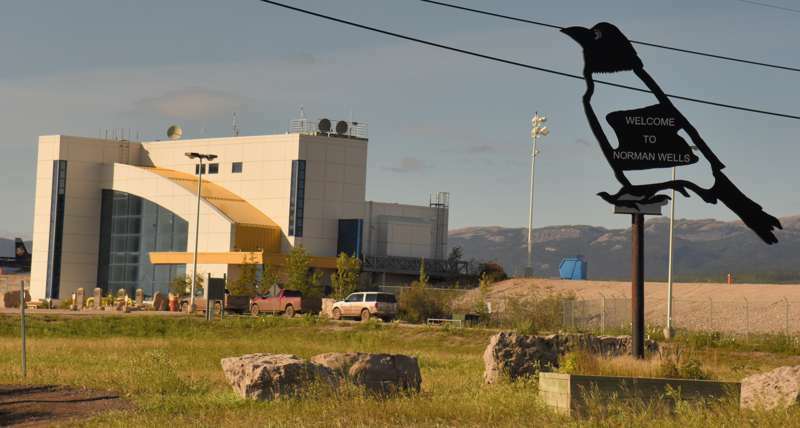 ^ ^ Finally, Norman Wells seems to really love ravens. The welcome sign at the airport has a raven design, and most of the street blades are also raven-shaped. Funny thing is, the day after I left Norman Wells, and started my long drive home south from Yellowknife, my car was attacked by a raven at the Fort Providence gas station. The bird was perched next to the gas pump, and did not appreciate my driving into its turf, so it started pecking and clawing at my car's roof (no noticeable damage, fortunately). I had to honk my horn repeatedly to get the raven to fly away far enough for me to get out and refuel my car. This was not my first encounter with a territorial raven in northern Canada, but the other time (south end of the Dempster Highway in 2012), the raven was guarding the diesel pump, and only glared at me while I was using the gas pump. I've been mildly interested in the Canol Road for years, since first hearing the Stan Rogers song as a kid. What has amazed me is how short-lived its usefulness was. 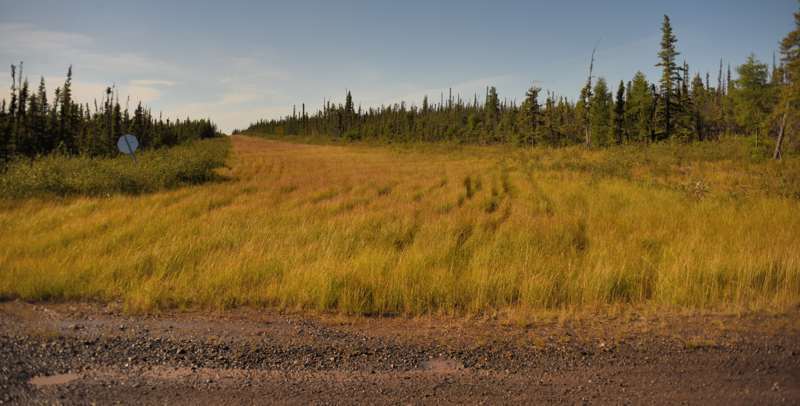 Yukon Territory brought its part of the Canol Road back to life as a summer-only highway (YT 6), for mining and recreational access. That'll be my next trip report. Thanx for posting the article. Very much in line with what I saw at the Norman Wells historical centre (besides the U.S. Army propaganda films being played in a theatre annex).